Using Catalogs as Filters - Pitfalls! You may have noticed the new Filters page in H3Viewer. Multiple catalogs can be used to host multiple help systems. Flipping between catalogs providing a kind of pseudo filtering system. However if you update a help Book that is installed in several catalogs then the update will silently fail. Apart from that catalogs work well. When a help file (package) is installed into a catalog, only one copy is kept in the help store. All catalogs reference that one copy. 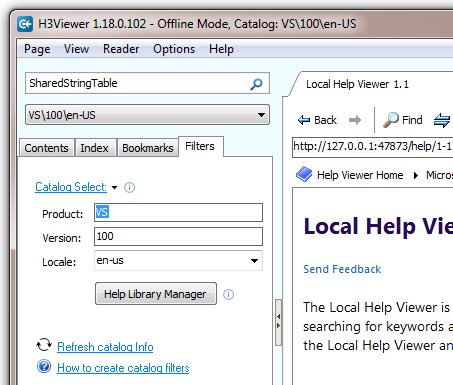 Help Viewer 1.x installs will fail silently unless you first uninstall any old help from "all catalogs". Although the Help Library Manager "Update" page seems to do the Uninstall automatically for you as part of the update of Microsoft content (or maybe this is because MS content is signed?). But neither Microsoft nor 3rd parties are expecting content to be installed across multiple catalogs. Updates will fail if the content is installed in other catalogs. So please uninstall those particular books from the other catalogs before installing updates. Today I used 'Help Library Manager' to update "Help on Help" (HLM reported an update). I had more than one catalog containing 'Help on Help' so although the update was reported as a success, in fact it had failed and after the update the metadata.xml file in the data store still reported my 'Help on Help' was “Fri, 18 Mar 2011 21:12:44 GMT”. Once I removed 'Help-on-Help' from all catalogs and install it again, the metadata.xml file in the store reported a new date of "Thu, 31 Mar 2011 01:12:12 GMT" and the .mshc file finally had new content. Catalogs are not supported yet by Microsoft although the Microsoft guys don't see a problem with using them. As you see above there is fairly major problem you do need to consider if you do use multiple catalogs. To update a book installed in more than one catalog, first remove that book from all catalogs (other than vs\100\*). If the book still does not update then also remove the book from the vs\100\* catalog. For Help Viewer 1.0 and 1.1 there is currently no easy way to remove a catalog once you create one.